This is a transcript of SYS Podcast Episode 231: Writer/Director Alex D’Lerma Talks About His New Indy Dramedy, Fear, Love, and Agoraphobia. Ashley: Welcome to Episode #231 of the Selling Your Screenplay Podcast. I’m Ashley Scott Meyers, screenwriter and blogger of the www.sellingyourscreenplay.com. Today I’m interviewing writer- director Alex DLerma who just did an arthouse indie dramedy called Fear, Love and Agoraphobia. We talk through exactly how he was able to bring that film to life so stay tuned for that interview. If you find this episode viable please help me out by giving me a review in iTunes or leaving me a comment on YouTube or retweeting the podcast on Twitter or liking or sharing it on Facebook. These social media shares really do help spread a word about the podcast so they’re very much appreciated. Any websites or links that I mention in the podcast can be found on my blog in the show notes. I also publish a transcript with every episode incase you’d rather read the show or look at something later on. You can find all the podcast show notes at www.sellingyourscreenplay.com/podcast, and then just look for Episode Number #231. A quick few words about what I’m working on as mentioned last week. The Pinch, the crime-thriller feature film that I wrote, directed and produced last year is for a limited time available for sale on the website. Just go to www.sellingyourscreenplay.com/thepinch. The Pinch is all one word, all lower case. Just the word “The Pinch” squished together all lower case. I’m gonna keep it for sale on the website for a little while and then eventually I will be rolling it out to iTunes and Amazon. So I am on the final stretch of The Pinch, if you would like to get it please check out www.sellingyourscreenplay.com/thepinch. In the meantime I’ve been working on my kid’s superhero animated TV show, sort of an homage to the great superhero cartoon shows of the early ‘80s. I’ve got my show bible written, definitely needs some work. I presented that last month to my writer’s group, I got a lot of good notes on that so I need to rewrite that. I’ve been working on the pilot episode, I’m almost done with first draft and then I’m hoping to finish that up next week and then next week I think I am up gain in my writer’s group so I’ll be presenting that, getting notes. So probably the next two or three weeks hopefully just polishing that up and finishing that off. That’s what I’m working on, now let’s get into the main segment. Today I am interviewing writer-director Alex DLerma. Here is the interview. Ashley: Welcome Alex to the Selling Your Screenplay Podcast. I really appreciate you coming on the show with me today. Alex: Yeah, thanks for having me. Ashley: To start out, maybe you can give us a little information about your background. Where did you grow up and how did you get started in the entertainment industry? Alex: Sure, I grew up in Central California…anybody who’s read any Steinbeck, all those little towns in there…King City, Greenfield, [inaudible 00:02:49] Red Pony, all those little towns in there. And I sort of just stumbled into the entertainment business my senior year of high school. I was ditching class and I met a girl in an art class I was hiding in who worked for the local radio station. I absolutely had no idea what I was gonna do after high school. None. And I just looked at the stationery she was working on and went, “Oh radio that sounds interesting.” And then I sort of charmed my way into that radio station and that was my introduction to broadcasting, and then later I became a radio broadcaster. That led to acting, that led to screenwriting and then filmmaking. So the dominoes all fell from ditching class, so don’t go to school kids. Ashley: [laughs] Maybe you can talk about that transition a little bit moving from radio to film and TV. What would you consider your sort of the step taking that leap into not just audio but audio and video? And a buddy and I were shooting baskets one day. We both had recently made a bunch of money from some national commercials and we were like, “Hey, let’s do our own movie.” And we wrote our own script and we produced it and edited it and I directed it and starred in it and…It was shot in 16mm, it was a 90 minute feature and we were just dumb enough to not know any better. It came out great and that was the first real screenplay that I had ever written and then after that I started to learn how to really write a screenplay [laughs]. Ashley: Something that comes up often on this podcast when I’m talking to guests, so often there is this moment in one’s life where they kind of take a leap of faith and they go down a road that they don’t necessarily understand and you’re going and making this movie. I assume you didn’t know how to edit, you probably didn’t know how to do lighting and cinematography, all of these things, or even how to hire people. How did you have the confidence that you’d be able to go down there? Because I get so many emails from people and you can tell they’re just lacking that confidence. How do I know how to get a good cinematographer? How do I know if my director is doing a good job? All of these sorts of questions that are very hard to answer and when you’re going into these things you definitely don’t know the answer, but sometimes you need to just leap in first. How did you have that confidence to do that? Alex: Yeah, that is a great question because as I grew older I was losing some of that fearlessness that I had from youth and ignorance. And so the answer is if you could tap back into your youth and ignorance and remind yourself that at some point in your life you weren’t afraid to fail, you just went for it. I’m sure there were times when I was a kid I didn’t wanna do something because I was afraid I was gonna get hurt or whatever. But generally speaking I would try just about anything unless I thought it was gonna kill me. And so because that ignorance and fearlessness had served me well early on with radio and then acting, I try to remind myself of that when I start to say, “I can’t write a screenplay,” or “I can’t direct a movie.” And I thought, “Wait a minute, it’s not brain surgery.” That’s one thing. The sciences are a whole different thing. Certainly you do need to have mentors and instruction and you need to know your craft as a writer, as an actor…whatever. But the real truth behind that is you can start with a little bit of talent and a lot of tenacity and you could create something that then becomes your foundation and just excites you, gets other people to believe in you, that you have some talent. So I always say it’s not brain surgery. It’s not easy but it’s not cracking up in somebody’s skull. So why don’t you just go for it. Tap into that youthful ignorance and fearlessness. Ashley: So what were your goals with this first film? Get into some festivals, maybe move your career as an actor down the line? What was the goals and importance for doing it? Alex: You just nailed it. It was the typical thing of this is now gonna move my acting into movies. It’s gonna launch me more so as a movie actor and little did I know that then I got bitten by the writing, producing, directing bug. So within a couple of years I wound up just pushing acting to the side and deciding I can’t do it all. Other people can do it all, I can’t. I just have so much energy and time so I decided to just focus more on writing and especially producing and directing. Ashley: Let’s dig into your latest film Fear, Love and Agoraphobia starring Lori Petty. Maybe to start out you can just give us a quick log line or pitch. What is this film all about? Alex: Sure, Fear Love and Agoraphobia is a drama comedy and it’s about people who are trapped in their own lives. And so the two main characters, one is an agoraphobic man who has been living with his mum and hasn’t been much out of his house for 10 years since he graduated high school. That’s due to agoraphobia which is the fear of being out in public places. And then the female lead is a female marine. Her husband is serving a life sentence in prison. So because of her sense of honor and duty and her commitment to her husband she’s kind of trapped in her marriage and all her funds run out from trying to help her husband and she’s living in a little van. And so all those three characters through different circumstances are just trapped within their own lives and so that’s what the whole movie is about. I wanted to explore that because I think all of us at some point feel incapacitated or just trapped within our own lives for a number of reasons and we just feel paralyzed. So I wanted to just play with that a little bit and it worked out really great. Ashley: Perfect. So where did this idea come from…what is the genesis for this? Alex: I teach directing and acting and that’s another thing I sort of fell into. One of my students, long time student Dustin Coffey was the agoraphobic man. He came to me and wanted to hire me as a director and to help him polish a script that he wrote for himself to promote his acting. I didn’t feel he had enough money for the budget, I really wasn’t interested in the script that he wrote, but I’ve always believed in him. He’s a very talented actor and so I said, “I think I’m ready to do my second feature, can I write something for you?” And he went, “Yeah, you know I got this money here and…” I said, “Let me write something for you.” And then I pitched him the idea of how about let’s explore this loneliness, depression, being trapped, but do it in a unique way and you’ll be this agoraphobic man. He knew a little bit about that, he had a friend that suffered from that and that’s how it all came about. I was ready to do my second feature and I wanted to help his acting career and it all worked out. He’s won a bunch of acting awards for this and he just spoke to Dave Bautista from Guardians of the Galaxy that shoots in July. So it’s going well. Ashley: Perfect. Do you know someone with agoraphobia? Was there some personal end with this particular element? Alex: No, because I knew Dustin Coffey was gonna be the lead man, the agoraphobic, I had him do my research. He’s got to do that research for himself as an actor regardless and I said, “Why don’t you see if there’s some medical professionals who are willing to talk to us, see if you can find some people who suffer from agoraphobia?” He did, he recorded interviews and brought them to me and he got some books and brought them to me and we went through all that and he was my researcher for that part of the script. Ashley: And I wonder too when you were coming up with these ideas, the fact that the guy is agoraphobic means he’s gonna be contained to the house. From a budget perspective that’s a good thing for an independent film. How much did that play into sort of the calculus of this whole thing. It’s like you have an interesting character that has something that would keep him pinned to the house. Alex: You’ve been doing this for a while, right Ashley? Ashley: I’ve done a couple of interviews. Alex: Yeah, you nailed it. When Dustin came to me with his script and I said, “You don’t have enough money to do this. If you can do your own film the cheapest thing to do would be a horror film because you can tell a story in one central location.” He said, “I like horror but that’s not what I wanna do. I wanna do something that’s gonna just have a little something more to say, and typically the horror genre doesn’t lend itself to that.” So by putting on the producer cap I went, “Okay, how do I contain him? He’s agoraphobic, so…” And also the agoraphobia would tap into something that like I said I had been thinking about. I wouldn’t be interested to do a script about loneliness, depression…all of that sounds really downbeat and really just a downer. But agoraphobia and the guy in prison and the girl in her van, it all just made it a little more cinematic. But you’re right, the primary thing was agoraphobia was gonna be good for the budget. Ashley: Okay, perfect. So let’s talk about your writing process for a little bit. Where do you typically write when you’re writing your script? Alex: I try to go to a coffee shop. I can’t write in the house because I look for things. I look for reasons not to write. “Oh, I’ve got to fix that thing over there on my wall or I’ve got to…” Because I do have a home office I do video editing and stuff, but I can’t write here, I’ve got to go to a coffee shop. Ashley: Okay. And when do you typically write, morning, all day, afternoons, evenings? Alex: It’s usually later. It’s at the end of the day. It’s like 6pm, 7pm, something like that. Ashley: Okay, and when you’re working on a screenplay writing, what do those look like? Are they long 12 hour bursts or are they shorter, just a little bit every day? Alex: Yeah, it’s shorter little bursts. I can’t do the Woody Allen thing where he’s up in the morning and it’s a schedule. I just can’t do that, I wish I could. For me I do a lot of day dreaming about it, writing about the characters, trying to get them to be more real to me and then just create that whole universe. I used to just improvisationally write and it was horrible because it would just take forever and obviously…So once I’ve got that whole universe math out then things go quick. They go quick but there’s a lot of daydreaming and planning and just trying to own all of it if that makes sense. Ashley: Let’s talk about that for a minute. How long is typically this daydreaming/planning stage? Are we talking like it can go on for years or is that something that will go on for a couple of months and then you’ll open up final draft and bash out the script? Alex: Several, several months because I tend to think, “Oh, I got these great ideas,” and then after a while I go, “Oh, that’s never sort of the brainy bunch here [inaudible 00:16:30] or something…I don’t know. I’ll go, “Wait a minute…crap. I was tapping into [inaudible 00:16:35] and I didn’t know it or Harrison Ford, I don’t know. Ashley: What is your development process like? Do you have a couple of trusted friends you send it out to them, you get notes? Maybe talk about that a little bit. When’s the script you feel like it’s to the point that you need some second set of eyes on it? Alex: For me I’ve got to hear it out loud and I don’t like people to comment on the writing unless they’ve heard it out loud. So I gather together a groups of actors, we do a table reading and yeah, for me it makes a big difference. Ashley: And do you get notes from the actors, you listen yourself take notes, do you bring in other writers to listen as well? Otherwise it’s too overwhelming. You’re getting a bunch of people with a bunch of ideas and it’s coming from people who have really maybe only written one thing or never written anything and they might be a good actor but they don’t understand what putting a screenplay or a movie together is. And that can be dangerous because earlier on that sort of made me feel like I wasn’t talented or it just took away my enthusiasm. And so I quickly learned get advice from people who know what they’re talking about. But there is value in people who read it or see it just for them to say, “I got confused. I didn’t understand why she was over there and why he was doing that.” That has great value. So, sort of a long-winded answer. Ashley: No, that’s a great answer. This is kind of an indie art house film. How do you approach screenplay structure with a film like this? Blake Snyder, Syd Field, do you have your very delineated three acts or are you more free flowing? Alex: I am more free flowing and because I also knew this was not really a plot driven movie. It’s what I would just call a character study similar to Lost In Translation and there was another film. Because my cinematographer was concerned as he should be in saying, “I don’t know if this is gonna work, because like what are they fighting for…all the questions that we’re also always supposed to be answering and writing. And I like those types of plot driven narrative films where there’s [inaudible 00:20:24] whatever it is. But that’s not this. This was very free flowing and I wasn’t concerned about a certain page count, by page 25 he’s got to do this and she’s got to do that. As long as I wasn’t boring people I knew that would work and I needed two really, really strong actors to carry the film and they do the leads. Lori Petty is more of a supporting and she was important for the film too but it really rests on the shoulders of the female marine and the agoraphobic man. Ashley: Okay, so once you’re done with the script, you have a draft that you’re ready to start I guess green lighting, did this actor have the full budget or did you guys have to go out and raise some additional money? Alex: No, he didn’t have the full…well, he did have a full budget for the original script I wrote that was just about him but it was boring. I said, “We got to open this up by screening this female character, this marine,” and then that doubled the budget. But I was now emotionally invested in it and I said I’m gonna be the other…I’m gonna go ahead and not just be the writer-director, I’m also gonna be an executive producer on this and put money to it. And then we still didn’t have enough money and we did crowd funding for the remaining funds and that’s how this particular feature was done. Ashley: Okay, perfect. Do you have some tips for crowdfunding for people that want to potentially go out there and try and crowdfund their film? Ashley: [laughs] Okay, perfect. I wonder too if you can talk about the casting process for getting someone like Lori Petty who has some name recognition. Maybe you can talk about the process. I get emails again, just all the time people are saying, “How can I get this particular actor in my movie or that particular actor in my movie?” Maybe you can talk about your process. Did you guys hire a casting director, did someone that you knew have a relationship with her? Maybe you can just talk about that path of getting her in the film. Alex: Yeah, you just threw out multiple things that everybody should write down and remember it really is contacts, who you know. I knew this casting director who is now retired, his name is Joseph D’Agosta. He played a small part in my original feature film and then so we had a relationship, so then I could go to him for my second feature, Fear, Love and Agoraphobia to reach out to Lori Petty’s manager or agent. I can’t remember which one it was. Because just regular people like you and I can’t pick up the phone and make an offer to an agent. They won’t accept it. They won’t accept it as a legitimate offer for their name actor or client. So it’s just…to me I’m like why won’t you want this money, who cares where it comes from? But to legitimize yourself you either have to hire a casting director or negotiate something with them. All I needed really a casting director was to get my name actor, that’s it. Because I’d already cast all the other actors on my own. Most of them were my students who were very, very talented and was a co-production through that acting, directing studio. So anyway, Joe D’Agosta was the guy who was able to connect us with Lori Petty and help negotiate the deal and she did great. It was good to have that name actor there. Ashley: Yeah, and so how important do you think having a name like that has been maybe with film festival submissions and also submissions to distributors? Alex: I don’t even have to answer the question, you just did. Ashley: So very important is the bottom line? Ashley: Yeah, high profile. I know, we get it. Well perfect, what advice would you have for people that are looking to break into TV or film as a screenwriter? Alex: As a screenwriter, boy! I really have fallen in love with it now. I really do enjoy writing and I wish I had more time for writing. I went into it out of necessity but if I was gonna go back in time and I was gonna give myself advice, I would say start developing…just write as much as possible, treat it like another job, like the Woody Allen thing. Just write and write and write and write and write. And then just with your own friends, because now we have technology anybody can make a little movie for themselves on their iPhone on their android or whatever. Take a scene from your feature or write a shot and actually produce it for yourself. Not to put out into the world. There’s something about being able to see…you can write all day long but I learned so much from actually being able to produce, direct and edit and screen my short films as well as the two features. It taught me so much the next time I went to write something because then as I was writing I’d go, “Oh, the director doesn’t need that,” or, “He’s gonna need this,” or, “We can do this through behavior, we don’t need dialogue.” I became such a better writer by understanding the other parts of filmmaking. And you don’t have to pay money to do that. You literally can just get some friends together and then edit it together on your phone and it just taught me so much. Ashley: Yeah, for sure. Anything you’ve seen recently that you’d recommend, TV, Netflix, HPO? I just like to end the interviews just by getting some maybe recommendations from the guests of what they’re watching. Alex: Only if you give me a recommendation. Ashley: Okay, yeah. I would say…maybe I’m behind the times but I finished up a couple of months ago Black Mirror on Netflix and I thought it was one of the best shows I’ve ever seen. I just really enjoyed it. So that’s my recommendation. If anybody hasn’t checked out that I’d definitely recommend it. Alex: Yeah, I came into Black Mirror late as well and I liked it as a very dark, twilight zoney. Yeah, it was cool. I came into Picky Blinders late and I’m loving that. That’s on Netflix, Picky Blinders. I just saw…God, what a memory I’ve got. I saw a film a few weeks ago, it’s called The Rider. Amazing! It’s a very, very, very low budget film, it has won awards in things at the Cannes Festival, Sundance and it’s by a filmmaker…She was born in China…she’s Chinese. She immigrated to the United States, went to school here, had no big dreams of being a filmmaker. She just sort of…, “I’ll try this,” which goes back to your earlier question Ashley about taking that job. And she was very successful with her first feature and now the second one has won all those awards. It had a limited national release, I saw it here in Los Angeles and I just loved it. It also reminded me a little bit of my own film. It’s character driven, it’s not really plot driven and it takes place in this Indian reservation. None of the actors are actors. They’re real people but it’s not a documentary. And it was so interesting to see how she pulled that off and how she got non-actors to do this and you can see that they don’t really have a big budget but cinematography is beautiful, story is really good. I would really recommend that film to inspire screenwriters and filmmakers who think, “I don’t have money and I don’t know anybody who’s rich. How am I gonna do this.” It will inspire you. Ashley: Perfect. Yeah, I’m gonna check that one out for sure. So how can people see Fear, Love and Agoraphobia, do you know what the release schedule is gonna be like? Alex: Yeah, we had a Video on Demand release I think like a month ago, something like that. It’s [inaudible 00:30:52] ahead on iTunes, Google Play, Amazon. You can stream it on any of those platforms, there’s also DVDs available on Amazon and our first territory outside of the United States, we’ve got some kind of a deal happening in China. So they’ll being seeing us there, so we’re now growing so I’m very happy with that. Ashley: So what’s the best way for people to keep up with what you’re doing? Twitter, Facebook…I know you had a website I saw that talked about some of your acting classes. You can just tell us all of that type of stuff. Anything you’re comfortable sharing I will round up and put in the show notes. Alex: Sure, for Fear, Love and Agoraphobia you can go on Facebook or Twitter or Instagram and just type in Fear, Love and Agoraphobia, and then you’ll see what’s going on with us. And then we have a website www.fearloveandagoraphobia.com and there’s tons of interviews and awards and trailers and just good stuff there and you can contact us if you like. So yeah, that’s it. Ashley: Perfect. I don’t mind if you plug your acting classes to. Can you tell people maybe a little bit about that, do you have a website that I can look to on those? Alex: Sure, if anybody is an aspiring filmmaker or actor…I taught for many years at the UCLA extension for film studies, and so I simultaneously created the space called The Cinema Gym which is my own acting and directing studio. It’s located in Burbank and you can go online and you can find our website at www.thecinemagym.com. Like I said it’s for actors who are interested in really understanding and learning the nuances of acting for camera. I was always taught that there’s no difference between acting on the stage and the camera and it’s simply not true. And also for directors to really understand the complexity of directing performance which can be equal to or even harder…I think it’s harder than even directing camera because camera, you’ve got a camera, it’s got an instruction manual and you can figure it all out and it’s gonna do exactly the same thing every day. In a movie you get a group of individuals actors who are different. They’re from different philosophies, different ages, kids who you can’t talk to the way you would as an adult, somebody who’s really elderly. That’s a very interesting challenge to direct some elderly actors, so we’re doing all that and shooting it and it’s a blast and we’re also producing our own original content. I think we got three thing now. We do the web series called Yu Solve, we did Fear, Love and Agoraphobia which is like the current film and then we’re just wrapping up shooting a short film called Mortal Coil. My hope is to just do a project every year to just help my directing and acting students get some real stuff out there. Ashley: Perfect. Well, I will link to that in the show notes. Alex I really appreciate you coming on and talking with me. I wish you luck with the film, thank you very much. Ashley: I just wanna talk quickly about SYS Select. 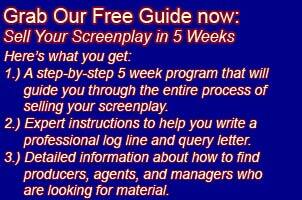 It’s a service for screenwriters to help them sell their screenplays and get writing assignments. The first part of the service is the SYS Select screenplay database. Screenwriters upload their screenplays along with a log line, synopsis and other pertinent information like budget and genre and then producers search for and hopefully find screenplays that they wanna produce. Dozens of producers are in the system looking for screenplays right now. I launched this service at the beginning of this year and we’ve already started to see some success stories. You can check out SYS Podcast Episode #222 with Steve Deering. He was the first official success story to come out of the SYS Select database. You can learn about all of this by going to www.sellingyourscreenplayselect.com. On the next episode of the podcast I’m gonna be interviewing writer and producer Rod Johnson. He’s produced a number of low budget gay themed films over the last few years, so we talk about his career which creatively started when he wrote a children’s book. We talk about that. That ended up leading him to writing for Disney and now eventually he’s found his role as a producer producing these low budget gay themed films. So we talk through his whole career, how he got his foothold, how he advanced from one state to another, so keep an eye out for that next week. To wrap things up I just wanna touch on a few things from today’s interview with Alex. There’s a lot of great information in here. Alex was very kind to come on and talk and be very transparent and gave us a lot of really good inside information about producing one of these types of films, this arthouse dramedies. I especially liked how candid Alex was about finding the actor who wanted to fund the film. This isn’t something you hear a lot about because producers don’t really wanna talk about it. It’s a very common thing in independent film, basically getting an actor to pay to play. Actors make good partners in these sorts of relationships because they get a lot out of the success of the movie. If the movie is a success they will benefit a tremendous amount because obviously they are the face of the film. So it makes sense that they might wanna kick in some money or otherwise help out with the production to make the project a success. Again, they’re gonna reap a lot of the rewards, so it’s a very mutually beneficial relationship. You as maybe a writer, producer bringing them on as an actor obviously you have to make sure that they can act halfway decently, obviously you’ve got to write a role that they like, something that showcases their talent. So there’s definitely some pieces that you have to fit together, but again this is a good relationship for a writer to have with an actor because again, the writer or the director or the producer, they’re gonna benefit a lot if this film is a success but those lead actors are gonna also benefit a lot as well. So finding those actors that have the means to kick in is obviously a key part of that. There’s no magic bullet to that. It’s really just a lot of networking. But I just think again, it’s a good way to look at these things about putting these kinds of projects together. Keep an eye out for partners who might be able to fund your project or help fund it or partially fund it. Again, it doesn’t have to be just an actor…I think actors make good partners for all the reasons I just mentioned but a director or a producer, maybe even a make-up artist, if you find the right make-up artist that’s trying to really showcase their talents. Maybe there’s a make-up artist that does really good monster make up and they need a script to showcase that talent, again you might be able to partner with that person and they might be willing to put in some money just so that they can showcase their talents. It’s just all about making those relationships and figuring out a good fit for everyone. I get a lot of emails with questions and I got this email the other day from a writer sort of asking a similar thing. He was wondering…he wasn’t interested in necessarily selling his script. He was interested in building a team to help him produce it. And I think what Alex is telling us here, this is exactly that kind of thing is Alex obviously he’s teaching an acting school so he is interfacing with a lot of actors. That’s a great way to network and to build things if you have some sort of a talent that you can teach to a group of people a lot of people will come in, so that’s something. But it doesn’t have to be as straight forward as that. It’s all the things that I recommend on this podcast. Doing short films, writing some short films, getting those out there, meeting local filmmakers, going to local film festivals, meeting those filmmakers, maybe volunteering to be a production assistant…the PA, the production assistant, that’s kind of the lowest job in production. So if you’re young and you’re hungry and you just wanna kind of learn about being on a set, that’s a great entry. Just find some local productions and say, “Hey, can I come be a PA for a few days? I’m willing to do it for free.” It’s hard to imagine that these local productions would turn somebody down. And again, that’s a great way you’re getting on set, you’re meeting people, you’re networking, and that’s how you’re gonna ultimately build a team. That’s how you’re gonna meet people, you’re gonna find people that you click with. Some people you’re gonna think, “Wow, that person’s really talented, I wanna work with them.” And getting to know people on somebody else’s production is a great way because you’ll see them in their sort of real life, how they really act. You’ll see the people that are hustlers, are smart, are creative, are talented. You’ll be able to see those people in their environment being talented as opposed to maybe the people that are slacking, maybe the people that are not so talented. So again, it’s a great way to get on set and meet people and build your own team of contacts that can potentially help you down the road. So I think all this stuff is kind of all tied together. Everything I recommend sort of comes full circle to what I’m talking about with building these teams and I think Alex again is a real world example of how someone was able to put a film together through networking, through producing, meeting people and getting the right people in place and his film came together. Anyway, that’s the show, thank you for listening.